Back to Wilkes Barre this week! I’m really looking forward to seeing everyone there! Please help keep me away from those potato pancakes and those cookies from Circles Deli! Posted: 13 May 2010 . / Categories: Where's Zim? Today it’s off to Patton, PA first and then onward to Indianpolis on Friday for the Broad Ripple Art Fair. It’ll be a first for me. Let’s see how it goes! Off to the Bethesda Fine Arts Festival this weekend in Bethesda Maryland. If you are around stop by my booth! Just got back from a great weekend in Austin and now it’s Crafts at Lyndhurst this weekend. Posted: 21 April 2010 . / Categories: Where's Zim? I’d like to say “Nothin’ quite like a cheap hotel in the middle of nowhere” but I guess when there’s not much to shoot and I’m not totally in the middle of nowhere (Nashville), there isn’t much to brag about eh? off to bed cause it’ll be another long day on the road in the mornin’. Posted: 20 April 2010 . / Categories: Where's Zim? Posted: 20 January 2010 . / Categories: Where's Zim? Looks like I’m heading down to Austin, TX this year for Art City Austin in April! Posted: 07 December 2009 . / Categories: Where's Zim? So how did it go and were ya cold? These were the two big questions everyone asked after the “hunt”. Overall it went just fine. The day started before dawn. After getting dressed with Under Armour, Carhart, Camo and bright orange gear, we hopped onto an ATV and rode across the family farm to the “blind” (if you don’t know what that is look it up). It was still dark when we got there and as the sun came up it began to snow. I was with Cousin Andy (Cousin Kathy Jo’s husband). The night before, Andy prepared us for the hunt by showing us his riffles, telling us about deer and their keen sense of smell and hearing. He talked about not using deodorant and wearing clothes that didn’t make noise. Everyone had asked if I was going to carry a gun and I said, “Yes.” I figured, in for a penny in for a pound! Right? Having been very unsuccessful shooting with pistols previously, I had no fear of actually hitting a MOVING deer! So there we sat waiting. The sun came up, the snow began to accumulate, the wood peckers and squirrels came out. The time passed… and the snow accumulated some more. And then… I had to pee, uggg. It was only 9 a.m. and I felt like an idiot. But alas, Andy, a good guy, offered to run me back to the house. Although just a couple of minutes away, it meant revving up the ATV and making a lot of noise! Peeing in the woods is not new to me, but having to remove that many layers before doing so with only armed MEN running around the woods made me nervous! Did I mention the NEON orange clothing? By 11 a.m. nearly 2 inches of snow had fallen and things were looking beautiful, but no deer. Then a rumble of ATVs. Everyone had gathered near our blind to discuss a “plan”. No one had seen deer. The question begs – who were these people? Well, as mentioned in the previous posting, we were on the family’s land. Almost all of the cousins are hunters. Whether or not they farmed, they hunted. 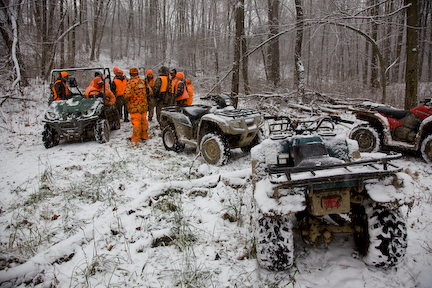 And since the hunting season in PA only lasted 2 weeks it was a given that everyone would be out there on Saturday hunting. And everyone, all 11 of us were related one way or another. As no one had seen a deer that morning, they decided to do a “drive”. This too was fruitless. After lunch, Andy and I returned to the blind until 4. The woodpeckers had mostly disappeared, the squirrels were gone and it had gotten so still that a spider started to build a web in front of our blind! In the end I was glad we didn’t see any deer. On Sunday Andy set up some targets so I could do some shooting, and as it turned out I was a better shot than I thought – at least with a rifle (we won’t talk about the pistols). So had a deer come by, there was actually a small chance that I might have hit it. So how was it? I must say I had fun, I’m glad I went cause now I “get” it. I had a lot of one on one time with Andy. We discussed family, politics and shooting (both with a camera and rifle). 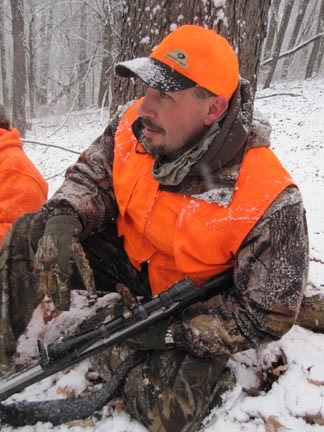 Much of hunting is about being in and enjoying nature; there is a lot of time to sit and contemplate. 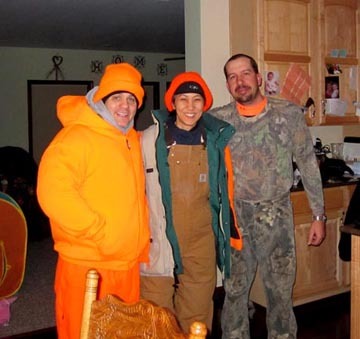 And although I was the only girl in the group, Andy told me that he would support his daughter if she wanted to get into hunting when she is old enough. My respect for these cousins has grown even more. They eat everything they shoot (deer, turkey, squirrels etc). They only shoot bucks and not does, because a doe represents about 2-3 deer. They sell the hides and process their own kills rather than paying someone else to do it. In other words, nothing goes to waste and they are willing to do the dirty work themselves. As some of them raise cattle, I asked about the hormone free grass/corn fed beef thing. In these discussions I came to find that for all these people represent: meat eating, beer drinking, gun tottin’ folks, they fundamentally eat in a manner that is more sustainable and more environmentally friendly than most of those tree hugging environmentalists do. I have come to believe that they are among the very few who have a right to remain meat eaters. Andy told me that he doesn’t eat chicken because he knows what happens to them before they are processed, and since they don’t raise their own chicken… He also doesn’t eat meat from Walmart for more or less the same reason. When I asked him, “don’t you think the other grocery stores buy their meat in the same manner as Walmart?” He explained that he knew how each of the local stores were getting their beef and it informs his purchasing decisions. They also occasionally slaughter their own cattle; so that’s always clean. I also learned about their sense of family. While they were all strategizing that morning, Cousin Tommy’s father asked him to introduce me to his uncle. He said, “Uncle Bob, this is my cousin Zim.” Wow. That night, I cooked a “Vietnamese” dinner and although they didn’t enjoy everything, I give them a lot of credit for trying everything I cooked. Although it was just supposed to be Cousin Danny and Joe’s families for dinner, eventually everyone else (who weren’t at the hunt) showed up to pay us a visit too. They knew we were there and just stopped in to say hello. The best part is, on Saturday I was the only one doing any shooting! My weapon of choice was a full titanium Canon automatic, firing 5 frames a second loaded with a 105mm, baby! Click here. Having traveled to 34, countries, I have learned that EVERYONE wants the same things in life. We want to be happy; happiness is the ability to provide for ourselves and our families while living in peace. And although these folks seem to live on the far side of the moon (and I’m sure they see me the same way), we are the same. Thanks for a GREAT weekend Cousins! Looking forward to next year. Posted: 04 December 2009 . / Categories: Where's Zim? I’m heading off to Patton, PA momentarily. The stated purpose is actually to go hunting. But I suspect that the only real shooting I’ll be doing is with a camera. Although I don’t actually intend to injure, mame or kill a live animal, I am looking forward to trying out a shot gun, if only to hit a tree. I’ve been wanting to do this for a while and one of the things I was really hoping for was the opportunity to do some photographic shooting. We’ll be escorted by Mike’s cousins, who are real hunters. They live in rural PA on the family homestead. Some of them are still farmers and most look forward to hunting season with much anticipation every year. So it should be fun to hang out and to see what this is all about. I guess for this city slicker it should be an education. I’m going to try not to embarrass myself. Panama City and my own pillow. Posted: 01 October 2009 . / Categories: Where's Zim? I finally arrived into Panama City later that expected on Monday night. I spent Tuesday driving myself to the Miraflores Locks and other parts of the city. I must say that my visit was not a happy one. By about 10 a.m. the pain started. It would seem that I had caught some sort of flu. First the shivers (even while outside in 80% humidity and 90 degree temps), and then the aches, followed by stomach cramps. Thank God there was no vomiting or diarrhea, but the smell of food did make me nauseous. I fought my way through the rest of the day and went to the old town and took a few worthless photos (I’m sure). I did finally manage to find some tylenol which seemed to help break the fever. So I must say that my impression of Panama was very much colored by my poor health. I did manage to get myself back home yesterday (2 flights) and all I can say is that there really is nothing worse than flying when sick and nothing better than the comforts of your own pillow and bed. Things are not great today but they are looking up. Posted: 29 September 2009 . / Categories: Where's Zim? Posted: 27 September 2009 . / Categories: Where's Zim? I got back to Buenos Aires this morning. I think that Argentina can be summed up by three things beef, pasta and dulce de leche (caramel). Every restaurant I have entered in this country has had beef and pasta as main offering. It seems to make sense, esp. considering all of the dry land I have flown over. As I am sure it would be difficult to raise or grow much else. I am told that 30% of all Argentinians can trace their roots back to Italy and hence the pasta. Everywhere you go they claim to serve home made pasta. And as for the Dulce de Leche? I have no idea why but the people here are infatuated with the stuff (and that’s an understatement). I saw someone order flan (aka, creme caramel) with dulce de leche, and it looked as if there was more of that than the flan itself. Often restaurants offer you the option to add dulce de leche to your dessert. On the morning flight to Patagonia, they served 1 roll + 1 croissant side of butter and… you guessed it Dulce de Leche. Not jam, but Dulce de Leche. All manner of pastries can be found with Dulce de Leche on top or squeezed inside. At the breakfast buffet yesterday, not only were there the usual offerings of bowls jam and honey, but there were not one not two , but three different bowls of dulce de leche. Regular, low fat and with coconut! As a matter of fact they love it so much I found this at the grocery store! Posted: 26 September 2009 . / Categories: Where's Zim? Today is Saturday in Bolivia, and it would seem that I’ve gotten over much of the altitude problems I had yesterday. Everything feels better. (man was I in pain yesterday!). Although walking up a flight of stairs this morning still left me breathless. So the day started at 8 this morning in the market, and all I can say is boy do these people like to get a late start! Nothing really opened until about 10; there were many stores that did not open at all. The day was spent in center city La Paz. I wanted to see the local sites and visit the markets and to try the local street food. After visiting several churches it became clear that Saturday is wedding day. Today was also clearly first holy communion day and baby baptism day. Here is a video clip I shot at the end of today of a marriachi band after a wedding ceremony on the grounds of a church. My impression of Bolivia is that they do like to keep the streets tidy, there are plenty of public restrooms and there is not a culture of grazing all day long. You know what I mean, people who eat all day long (like me). Breakfast is available only for a couple of hours. Lunch is only available for a couple of hours, and so is dinner. There really is not much of a culture of cafe’s or snacking. So if you want to eat outside the meal window, you might find yourself very much out of luck! Posted: 25 September 2009 . / Categories: Where's Zim? This morning, got up, and took the 1.5 hour drive to Tiwanacu (about 1 hour in traffic). Another World Heritage site, this time of Incan Ruins. Although it was rather disappointing I must say I’m really happy to be in Bolivia. It’s exactly what I was looking for as far as experience is concerned. But right now with the altitude I’m feeling like I got hit by a truck. Thus far no amount of food or Coke Cola is helping. A short walk up hill leaves me wanting to sit down. It’s crazy. Here is me on top of Tiwanaku. This is having lunch with the locals and the local town. This is Great! We’re in Trouble! This is Great! This stinks. Posted: 24 September 2009 . / Categories: Where's Zim? So we arrived into El Calafate, on Monday (Patagonia). All I can say is WOW. This place is seriously spectacular. We were nicely surprised because there was a parade in the downtown that day. Yesterday, we started before the sunrise and drove 3 hours to the small settlement of El Chaltan from El Calafate, to take a look at a peak called Fitz Roy. The landscape here is awe inspiring. It reminds me of places like Colorado and Utah only much much bigger (at least so it seems. Well that’s the story i’m tellin’ myself anyway.). The weather was perfect. I saw crazy stuff like blue blue lakes and crystal clear rivers (when I say crystal clear I mean totally clear!!). I have never seen anything like it. With a 3 hour drive ahead of us, we stopped for gas at the only gas station in El Chaltan, only to discover that it was out of gas! Along the way we noted that there were no towns, no cities; basically nothing but the airport stood between us and the El Calafate, and that was more than 2 hours away. With only a quarter tank left, the happy day of cruising around seeing the scenery went south in a hurry. There was no businesses around to ask to siphen gas from either. The tourism season had not quite started here so many businesses are still closed. The people at the gas station suggested that we go to Tres Lagos, 75 miles away (and 30 miles of which were in the wrong direction), on a quarter tank of gas in a Chevy Corsa (not Corsica)… they all felt that this would not be a problem; it did not inspire confidence. Aren’t American cars gas guzzlers? Needless to say we made it. The gas station was a bit off the road, with no signs indicating that it was a gas station. For a momment I noted that it looked like a ranch. Had we not taken a second look to notice the two 1970’s pumps we would have missed it. For a while we wondered what we would do if they didn’t have any gas. It’s amazing how fear made me take note of the tall yellow poles along the road with solar panels labeled SOS. Had we not been in our predicament I would have sworn these never exsisted. Aside from the gas shortage, the day was perfect. The temperature was perfect. Blue skies and perfect little clouds; except for the perfect little cloud that covered the PRIMARY mountain peak we had came to view, which never actually cleared all day. (see photo). Other than that a perfect day. So today it was off to see Perito Moreno Glacier and an actual trek on the glacier itself. I had visions of another perfect weather day so that I might get some wonderful shots of the glaciers. Wouldn’t you know it? It started raining just before we arrived. And I arrived at the most open part of the viewing aread for the glacier, it was raining sideways. As for the trek? Yes it rained then too. During the whole thing. I had 5 layers on and was still cold (waterproof parka, fleece, sweatshirt, long sleeve T-shirt, and undershirt). After the trek they gave us time to eat lunch (which we had to pack ourselves) and wouldn’t you know it? they don’t have enough indoor seating for everyone, so I ate my lunch outside on the porch, continuing to freeze. So it was beautiful and amazing and it sucked all at the same time. I wrote that post last night at the airport and am uploading it now. After arriving at the Hilton last night after midnight we were informed that they did not have a room for us and had put us in another hotel down the street! All this at 1 a.m.!!! Now I have to find a place to get a yellow fever vaccination before heading to Bolivia today. Wish me luck. The Price of Citizenship & Yellow Fever. So you are wondering Bolivia?? What’s up with that right? Well, after a few days in Buenos Aires I had pretty much seen and done everything on the A list and then some. I had even been to some places twice. So in lew of staying on for a few more days with not much to do but to go to museums, so Bolivia looked like a good option. There seems to be a lot going on in this little country and I’m not sure when I would get the opportunity to go again, so why not, right? After booking the tickets it was discovered that one of the prerequisites for entry into BOlivia was proof of a Yellow Fever vaccination. So with the help of American Express’ Global assist, who gave me a list of hospitals in B.A. that could provide the vaccination, I asked the concierge at the hotel to call. Unfortunately the #1 choice – the British Hospital told her that they could not do it and referred us to a public facility. This did not inspire confidence, especially since they did not answer her calls. LUckily it was 6 blocks from the hotel. The office was in a non-descript little building with a very little sign that said “Fiebre de Amarillo” (Yellow Fever). As I opened the door to a small room with 2 benches on each side there were 4 people waiting. There was someone talking to a man who seemed to be hiding behind a door. When he was done he gestured to us to do the same. So we did. I said to the man “Yellow Fever Vaccination?” He said “Si. Tarjeta identificaccion” So we handed him our passports. I asked him in spanish, how much time. He replied “10 years” I asked again, “how much time to wait” He gestured like it was a stupid question, so we sat and waited. About 5 minutes later, they called our names the woman asked only one question (if I was pregnant), administered the shots and that was it. We did not fill out any paperwork (it was done for us) and no money was collected nothing. She handed us our passports and certificate of vaccination, and said “Ciao”. After arriving into Santa Cruz tonight I discovered that the Visa fee of $135 US Dollars was ONLY for Americans. Everyone else gets in free and no one asked for the proof of Yellow Fever vaccination either. After using the airport restroom it became clear to me that I am clearly back in the third world, and it feels exciting. This is a video clip in the La Paz airport, I noted that the belt which brings up the luggage is actually missing, if you look way in the back of the frame you will notice that there are men manually bringing in the luggage and putting them on the belt!